The Club has been inexistence for 10 plus years and meets regularly in an informal and friendly atmosphere. 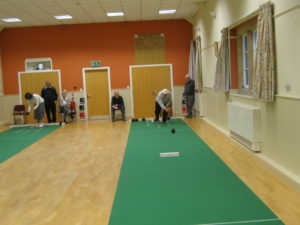 It is likely that the sport was first started in Wales by two South Africans who, having played bowls outdoors in their own country and, perhaps due to the poor climate, began to play a simulation of the outdoor game indoors in a church hall. Rules and conditions of play were drawn up and the game soon became established as a way for outdoor bowlers to keep their “hand in” but is now a competitive sport in its own right. 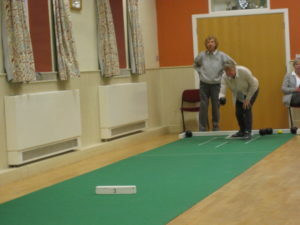 Played on portable lightweight bowling carpets, which measure 45 feet by 6 feet (13.75 x 1.85 metres) it, like other forms of the sport, uses full sized bowls to bowl up and down the carpet. The object is for each player in a singles game or each team in a pairs, triples or fours to gain as many shots as possible by getting their bowls nearer to the jack than their opponents, and so outscore them. The game is made challenging by the “block” which occupies the mid-position of the rink mat, and the defined area of the “ditch”. The presence of the block, which prevents players from playing with force directly towards an opponent’s bowl to knock it out of a scoring position, together with the narrow playing area, requires players to develop skill in using the natural bias on the bowls to bowl round the block. Bowls that touch the block or come to rest in the dead area or in the ditch (other than those that touch the jack before going into the ditch) are declared “dead” and removed from the mat. The primary skill requirement is in the fact that no two mats perform identically and all village halls have floors that are not perfectly flat therefore every competitive match is a measure of the ability of the visiting team to conquer an unfamiliar playing surface. Being a completely mixed sport in which men and women compete equally together it has become a great family sport involving both sexes and all ages from under 9 to over 90. We feel that the mixed nature of the sport creates a great social atmosphere and offers plenty of occasions for single players to play the game in a social and friendly atmosphere. New members are always welcome and we are happy to give instruction and to explain the rules to those who may not have played before. 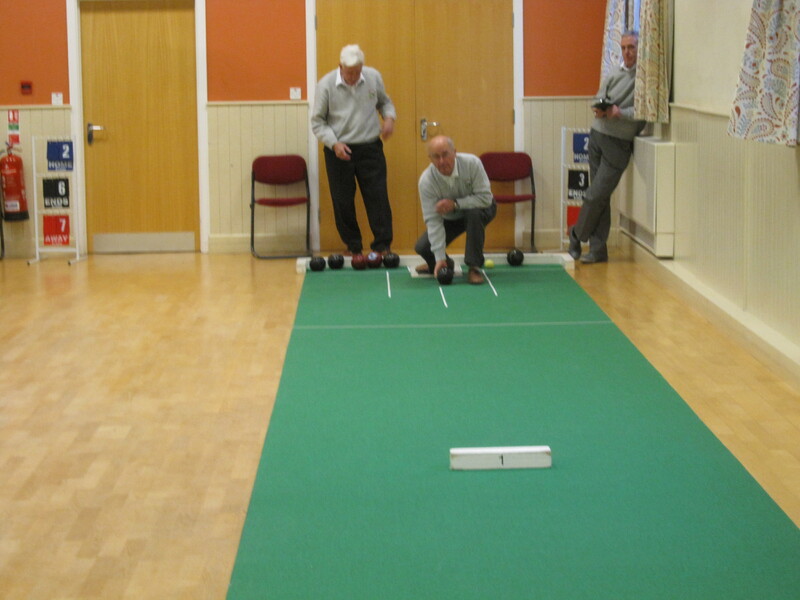 Bowling equipment can be supplied and the first three trial sessions are free. Matches take place at 7.00 pm on Wednesday evenings and 2.00 pm on Thursday afternoons in St Andrews Hall. We look forward to welcoming you.